Published: Dec. 13, 2018 at 10:15 p.m. Updated: Dec. 14, 2018 at 03:56 p.m.
Coming off their first loss since late-September, the Texans now have to travel to meet the Jets on a semi-short week. Even though they are in the middle of a re-build, the Jets are a formidable foe for the Texans' offense. Deshaun Watson is having an incredible season -- especially considering he's just over a year removed from tearing his ACL -- but he's having major issues against pressure. Per Next Gen Stats, Watson has the NFL's lowest passer rating (32.7) when under duress. Watson's -87.7 point drop in passer rating against pressure is the steepest in the league while his 1:6 TD-to-INT ratio is also dead last. While the Texans offensive line has struggled to keep Watson clean -- he's faced the seventh-most pressures on his dropbacks -- they are in another tough spot in Week 15. New York's defense is predicated on forcing pressure as they're fifth in the NFL in both pressure rate (29.1 percent) and blitz percentage (34 percent). The Jets may not have a standout member of their front-seven like the Texans' J.J. Watt, but they have four defenders with 20 or more pressures. They could cause fits for Houston. Key matchup: Can Nick Chubb continue his streak? Since the Browns traded Carlos Hyde, rookie runner Nick Chubb has been one of the most valuable players in fantasy football. Since Week 7, Chubb is among the top-five running backs in carries (128), team share of rush attempts (78 percent), yards after contact (3.8), and PPR fantasy points per game (19.6; RB5). In this span, Chubb has finished as a top-20 fantasy scorer in 6-of-7 games and has compiled five top-12 (RB1) weeks. Chubb has been on an incredible, league-winning pace. However, he faces his toughest test yet in Week 15. Over their last six games, Denver has committed eight or more defenders in the box on 33 percent of their rush attempts, the highest rate in the NFL per Next Gen Stats. The Broncos' insistence on loading the box has, unsurprisingly, mitigated opposing rushing offenses. In this span, Denver has allowed the fifth-fewest yards per carry (3.5) while they are the only defense to not allow a rushing score to a running back. Meanwhile, Nick Chubb has recorded a rushing score in five-straight games and he's third in YPC (5.8) when facing eight or more defenders in the box. It's on. One of the main reasons the Packers needed to move on from former HC Mike McCarthy was due to his failure to innovate in a changing in NFL. As the game has evolved over the last few seasons, offenses are shying away from throwing outside the numbers in favor of more attempts up the seam and in the slot. For example, the Packers' lead the NFL in percentage of attempts outside the numbers (54 percent) while the league average is only around 38 percent. It helps to have Aaron Rodgers, though. Even in a down year for the Pack attack, Aaron Rodgers has been stellar throwing outside of the numbers. Per Next Gen Stats, Rodgers has a 14:0 TD-to-INT ratio when throwing outside the number markers while the Bears route-jumping secondary leads the NFL in interceptions (13) on throws located on that part of the field. While Rodgers' stellar ball placement covers up the Packers' lack of creativity on offense, Chicago is cleaning up on throws outside the numbers (64.7 passer rating allowed; lowest in NFL). Somehow, Green Bay is still alive in the NFC Wild Card hunt and they must beat Chicago on the road if they stand any chance at the No. 6 seed. Rodgers must continue to be perfect and precise on the boundary. Key matchup: Can the Lions muster offense against the stingy Bills? Over the last month without Golden Tate (traded) and Marvin Jones (knee), Matthew Stafford has thrown just two passing scores and averaged an abysmal 6.1 YPA. In this span, Detroit is ninth-from-last in yards per drive and fifth-from-last in drives ending a score. Now, the low-ceiling Lions are in another brutal road spot in Week 15 against a Bills' secondary that owns the second-lowest YPA allowed (6.4) and rank fourth-best in completion rate below expectation (2.5 percent) per Next Gen Stats. This is not a contest for fantasy football goodness. After throwing 10 interceptions in his first four starts (Weeks 4-8) this year, Jameis Winston has quietly balled out over his last four. In Weeks 11-14, Winston has an 8:2 TD-to-INT ratio and a 104.3 passer rating all while averaging 10.7 air yards per attempt, the second-highest clip in this span. Much of Winston's success has come on third-down, where he has been both aggressive and efficient. Per Next Gen Stats, Winston is completing 8.1 percent of his passes above expectation (second-best) and averaging 3.4 air yards past the sticks (third-highest) on third-downs this season. In fact, no quarterback has a higher passer rating on third-down than Winston (119.9). Of course, while Winston has turned his season around against the Giants, 49ers, Panthers, and Saints secondaries over the last month -- they pale in comparison to the Ravens. Baltimore is arguably the stingiest secondary on third-downs, too. Per Next Gen, the Ravens have allowed the third-lowest completion rate below expectation (-7.9 percent) and have held opposing quarterbacks to the third-lowest passer rating (66.1) on third-downs. Jameis Winston is making a case for himself in his 2019 free agency bid, and he could further re-cement himself in the Bucs' plans with an efficient outing against the NFL's No. 1 defense. Fresh off compiling 155, 95, and 138 yards from scrimmage over his last three games, Joe Mixon enters Week 15 in a fantasy league-winning matchup against the Raiders. Oakland has been completely gashed on the ground this year, allowing the league's fourth-most yards per carry (5.0) and the third-most carries in which the ball carrier exceeded 15 MPH (60) per Next Gen Stats. Coming off a season-high 31 touch performance last week, Mixon should absolutely smash against an Oakland side allowing the third-most carries per game to opposing running backs (24.8). Key matchup: Can Saquon push for Eric Dickerson's record? Saquon Barkley is officially having the best fantasy season ever for a rookie running back. His 25.6 PPR points per game are most for a rookie back all-time while his current scoring pace is good enough for the 14th-highest scoring RB season ever. At his current clip, Saquon Barkley is on pace to hit an absurd 2,158 yards from scrimmage putting him only 53 yards shy of Eric Dickerson's all-time record set in the 1983 season (2,212 yards from scrimmage). While the Titans played stiff run defense in their opening seven games (4.2 YPC; 48 percent success rate allowed), they've sprung a bit of a leak across their last six contests (4.6 YPC; 54 percent success rate allowed). Barkley's push for the record books will be a close one. 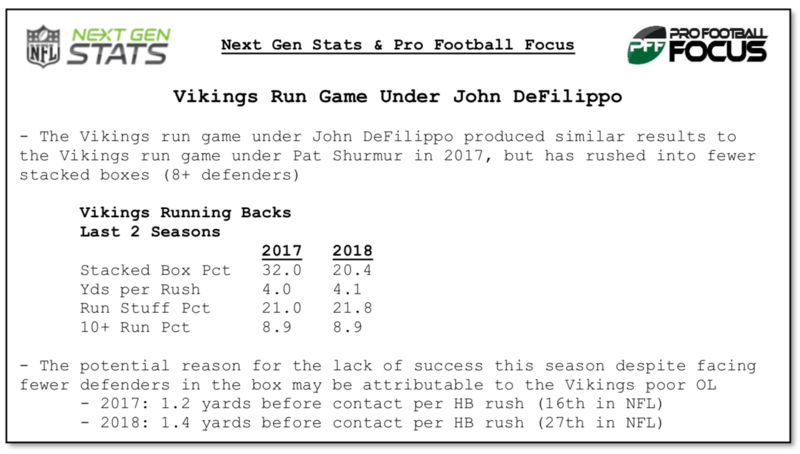 Key matchup: Do the Vikings actually need to run more? With long time QBs coach Kevin Stefanski taking over at offensive coordinator for the final three weeks of the season, it will be interesting to see if the Vikes' sharply increase their run rate. If nothing else, Minnesota's defunct rush attack is in a fantastic matchup against a Miami front seven that has allowed a monster 139.0 rushing yards per game on the road this season, fifth-most in the NFL. Key matchup: Can Redskins slow Leonard Fournette? After playing stout run defense in their first seven games (3.74 YPC allowed), the Redskins front-seven has sprung a leak over their last six. In this span, Washington has allowed a massive 5.34 YPC while Texans backs (28/132), Ezekiel Elliott (26/121/1), Eagles backs (29/134/1), and Saquon Barkley (14/170/1) have rolled up monster stat lines over the last month. Since Week 9, Washington has allowed 25 runs of 10 or more yards (third-most) and stopped just 14.6 percent of attempts at or behind the line of scrimmage (fourth-lowest rate) per Next Gen Stats. Obviously, Leonard Fournette's sophomore season has not gone to plan and he's coming off a horrendous game last week (16 touches, 41 yards from scrimmage), but he should eat in one of the most advantageous matchups possible in Week 15. At long last, the Cowboys have finally unleashed Ezekiel Elliott as a receiver. In 13 contests this season, Zeke has recorded a gargantuan 81 targets after seeing only 77 passing looks in his prior 25 games. In addition to leading the NFL in rushing yards per game for three-straight seasons, the Cowboys have also given Elliott a voluminous receiving role. Per Next Gen Stats, Elliott (24.9) trails only Saquon Barkley (27.8), Christian McCaffrey (27.8), James Conner (27.0), and Todd Gurley (26.8) in routes run per game among running backs. Indianapolis' front seven has stiffened since their bye -- they've allowed the eighth-lowest rushing success rate in this span -- but they are quietly getting whacked by RBs through the air. Per Next Gen Stats, no team is allowing more passing yards per game to receivers aligned out of the backfield than the Colts (58.5). In fact, 23 percent of the Colts passing output allowed has come out of the backfield, the highest allocation in the NFL. Considering he's coming off a torn Achilles and is now on the wrong side of 30, Richard Sherman is having a fantastic season. Per Next Gen Stats, Sherman has held opposing receivers to a 5.0 catch rate below expectation (25th-best out of 105 CBs) this year. Sherman isn't shadowing receivers any more -- he strictly plays on the left side of the field on 87 percent of his snaps -- but he'll have a tough task against Russell Wilson when he throws into his former teammate's coverage. This year, Wilson has the league's second-best passer rating (131.8) when throwing to the defensive left side of the field while Sherman's lone touchdown allowed came back in Week 13... when Seattle played San Francisco. For most of the season, JuJu Smith-Schuster was the Steelers primary slot receiver. That has changed over the past month as Smith-Schuster has shifted from a full-time interior role to a predominantly wide alignment. Per Next Gen Stats, Smith-Schuster has run 60 percent of his routes out wide on the boundary in Weeks 11-14 and his role change has led to more passing looks. In fact, Smith-Schuster has out-targeted (48 to 46) teammate Antonio Brown and sharply out-gained him (472 to 373) in this span. Now, the Steelers dynamic duo has an intriguing matchup against the Patriots and Bill Belichick's constantly evolving scheme. In past meetings, Belichick has traveled a single cornerback with Antonio Brown on the perimeter and it's likely Stephon Gilmore is tasked with shadow coverage in Week 15. However, the way to beat New England remains through the interior part of the field. New England has allowed 123.6 YPG to receivers aligned out of the slot or in tight to the formation this season, eighth-most in the league. The Pats' shaky slot coverage has continued recently, too, as they've coughed up the fourth-most PPR points to interior receivers over their last four games. Pittsburgh should routinely shift both Smith-Schuster and Brown in the slot often to take advantage of New England's main deficiency. After a rough two-game stretch in which Jared Goff completed 48 percent of his passes in road draws against the Lions and Bears, it's natural to search for reasons for the Rams' first tough stretch of the season. However, while Chicago has limited passing output all year and they are easily one of the three best all-around defenses in the league, Jared Goff has incredibly stark home/road splits. It's possible Goff and Co. immediately get back on track by simply going home. In six home games this year, Jared Goff's completion rate is 7.2 percent above expectation while his passer rating in L.A. is an efficient 124.5. Both of those figures would be top-two among qualified quarterbacks over the full season. On the road, Goff's completion rate actually dips 2.7 points below expectation and his passer rating is a near league-average 92.8. Now, the Rams get a home gift against a completely decimated Eagles' secondary. Over the last six weeks, Philadelphia has surrendered a 101.0 passer rating (11th-worst) and allowed a wide open throw (five or more yards of receiver separation) on 27 percent of passes (third-most). Goff and Co. are in a near perfect spot to go off in Week 15. There's no place like home. Key matchup: Can Cam get back on track? Clearly laboring through a sore shoulder, Cam Newton is not playing anywhere near 100 percent health. In fact, Newton has completed just 12 of his 27 passes that have traveled more than 10 yards in air over the last two weeks. Four of Newton's 5 INTs in this span have come on throws traveling 10-plus yards, too. Unsurprisingly, Newton's balky shoulder has crushed his confidence against pressure over his last two starts as his 27.0 passer rating under duress in Weeks 12-13 is better than only Mark Sanchez (6.8 passer rating) and Josh McCown (13.1). Yikes. With the Panthers playoff hopes on the line on Monday Night, Cam will have to muster up a masterful performance against a Saints' secondary that is quickly strengthening. In fact, New Orleans owns a 63.3 passer rating on all throws that travel over 10 yards in the air over their last five games. That's fourth-lowest in the league. For more context, the Saints have forced a tight window throw (less than one yard of separation) on 41 percent of attempts in Weeks 10-14. Only Minnesota (42 percent) has forced more tight throws in this span.